Spring 2001. On the right a grimy Metro North commuter run out of Grand Central arrives mid-afternoon in Waterbury, Connecticut. 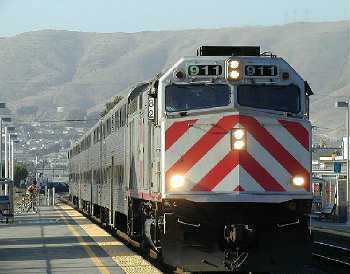 Its counterpart is a gleaming Caltrain local pulling into San Bruno on its way down the Peninsula to San Jose. Both colorful. Both on time. One commuter agency letting things slip, the other reflecting some spit and polish. September 2001. Berkeley, California. Cloudy mornings, tragic times in the air. On the left, the California Zephyr with a Burlington dome and Rio Grande sleeper lounge on the rear heads towards Chicago on Sunday, Sept. 9. Grandeur and innocence. 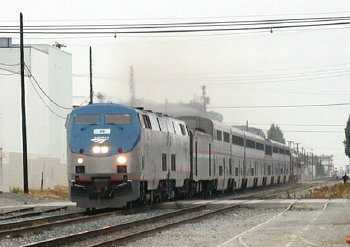 On the right, San Joaquin 714 on its way from Oakland to Bakersfield the morning of Sept 12, on time and filled with intercity travelers suddenly bereft of air service. Amtrak was heroic during this crisis. My wife was able to get home to Worcester from Philadelphia on Sept 13 close to schedule and safely; like many many thousands of others. As for my return from San Francisco to the East Coast on Sunday, Sept. 16. Utterly screwed up Delta reservation system (even for elite travelers such as yours truly), unbelievably lax airport security (no check of my electronic gadget and battery filled briefcase by donut munching screeners, cops posing for pics, bomb-sniffing tail-wagging San Franciscon Police dog off in a corner getting petted by German tourists). The airlines want up to $24B to help them recover, but from what? Terrorism yes, years of bloat, carelessness and customer-be-damned service, too. 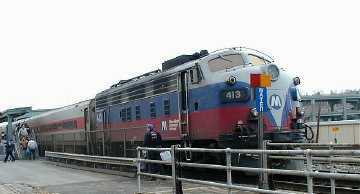 Amtrak remains threatened, short of equipment but suddenly long in public appreciation. Interesting times ahead. Here are two favorite photos, taken in 1968. On the left is Southern Pacific No. 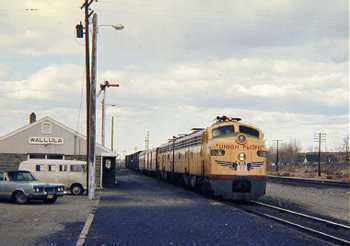 11, the Cascade, shot just south of S P's Brooklyn yard, Oregon, on its way from Seattle to Oakland, with a full complement of sleeping, chair, lounge and dining cars. Though it enjoyed considerable patronage it was nevertheless subject to Southern Pacific's 'passenger be damned' attitude and spotty on board service. On the right is UP's Train No. 19, photographed in Wallula, in Eastern Washington. 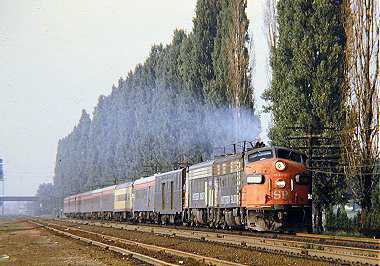 This train was part of an inland route which took it from the UP's sparkling little station in Spokane down to Hinkle, where it connected with Train 11, which went on to Portland via The Dallas and Hood River. The VW camper in the photo is mine -- for over 20 years trusty transportation which carried my wife and me to over 40 states, Canada and Europe, making these and many other photographs in this gallery possible and fun. January 1, 2002. 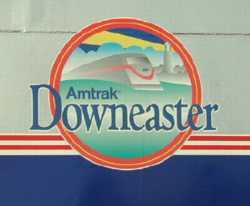 Amtrak's Downeaster No. 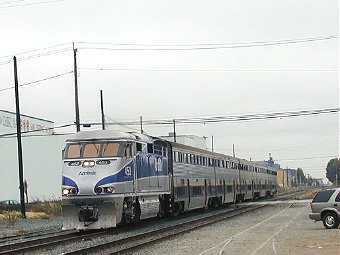 684, pulls into Dover, New Hampshire, on its way from Portland, Maine, to Boston. We spent a few days in Maine and noticed quite a bit of media saturation for the four daily round-trip service, which, after many years of delay, began on December 15. The train is well branded and well patronized. It's still running, thanks to some stonewalling by Guildford Transportation, which is owned in part by airline and other local transportation interests, at less than 60mph, but new stations, as in Dover, are being built or restored up and down the line and if Amtrak stocks the cafe, supplies enough equipment and cleans the windows (two of the three trains I saw were already pretty grimy -- victim of a common Boston North Station disease perhaps) Downeaster service should be a relief for travelers increasingly frustrated with jammed interstates. 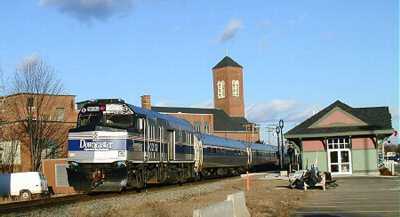 Oh, and it seems to me that a service via Worcester to New York and Washington would be winner. But one thing at a time. And Happy New Year!